Sri Lanka’s trade gap widened considerably to US $ 1.06 billion in February from US $ 743 million a year earlier, while the cumulative gap for the first two months of the year expanded to US $ 2.1 billion from US $ 1.68 billion during the same period, last year. 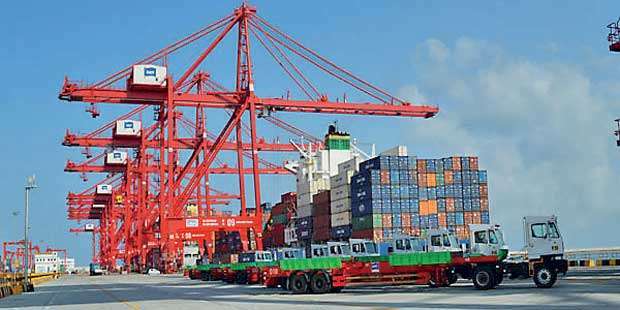 Recent trade data concerning Sri Lanka’s dealings with the rest of the world shows the country has imported US $ 1.97 billion worth goods in February, which is an increase of 23 percent from a year ago. This was despite the expenditure on fuel imports-the most troubling commodity for Sri Lanka-seen easing in February. The February fuel bill fell 11 percent year-on-year (YoY) to US $ 315.2 million. The somewhat eased fuel bill was perhaps due to base effects as the expenditure on fuel is expected to rise significantly, with Saudi Arabia pushing oil prices to at least US $ 80 a barrel. Currently, Brent crude prices hovers around US $ 75-76 per barrel range. The Asian Development Bank (ADB) Chief Economist Yasuyuki Sawada last week said a sudden escalation in global oil prices is unlikely in the short and mid terms. The non-fuel imports during February rose by 32.3 percent YoY to US $ 1.26 billion. A closer look at the import basket shows a surge in gold imports, which rose 140.1 percent YoY to US $ 112 million, while fertilizer imports also rose by 127 percent YoY to US $ 20.3 million. The government earlier this month slapped a 15 percent duty on gold imports to rein in excess imports of the precious metal by importers who seek an arbitrage opportunity via smuggling gold to India. Meanwhile, Sri Lankans spent US $ 114 million in February to import vehicles, up 122 percent YoY, turning the country’s commute on urban and semi-urban roads a nightmare. Every middle class family in Sri Lanka aspires owning a car to avoid the hassle of public transport. The total consumer goods imports rose by 29 percent YoY to US $ 442 million. Meanwhile, the total export earnings for February rose by only 5.5 percent YoY to US $ 916 million while the cumulative earnings for the first two months rose by 8.6 percent YoY to US $ 1.9 billion. The increase in exports was mainly driven by tea, which rose 3.8 percent YoY to US $ 118.2 million. Export of petroleum products earned Sri Lanka US $ 46 million, up 67 percent YoY, while textile and garment exports rose 2.7 percent YoY to US $ 407 million. Earnings from export of food, beverage and tobacco rose 25 percent YoY to US $ 29.6 million while export of rubber products rose 5.4 percent US $ 68.3 million. Significant reductions in export earnings were seen in coconut exports, rubber and machinery and mechanical appliance exports. If the gap in Sri Lanka’s trading account continues to widen, the country is likely to confront major challenges in the external front as it has an estimated US $ 15 billion in foreign debt repayment during 2019-2022 period.